The Road To The International Passes Through Split, Croatia! Part of the Dota Pro Circuit 2018-2019 competitive season, the AMD SAPPHIRE DOTA PIT Minor will play host to the most skilled and competitive Dota 2 teams on the planet as they compete for enough prestigious rewards and points to qualify for The International in Shanghai 2019. Over the course of seven entertaining days, [April 22nd-28th] the Spaladium Arena in SPLIT Croatia will transform to become the focal point for the Dota 2 universe. The eight teams that qualify for the tournament through the closed qualifiers (April 3rd – April 6th) will be split into two groups, playing the best-of-three games in a round-robin format. “We are happy that we have such large and professional competition in Split and that we are part of the event that represents additional contribution to the development of domestic and regional esports scene. AMD SAPPHIRE Dota PIT Minor will be, along the qualifications of the third season of the A1 Adria League, the esports highlight of this spring. 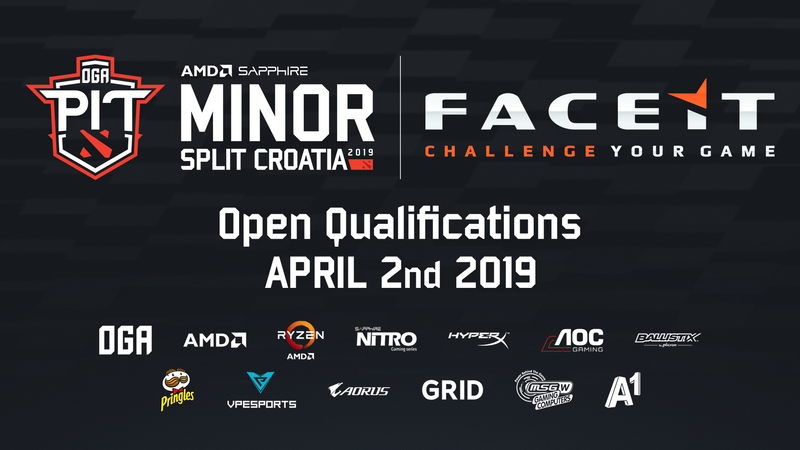 We also believe that this will be the best ever esports year in our region“, was said from A1 Hrvatska, AMD SAPPHIRE Dota PIT Minor tournament partner. One Game Agency is a new Technology Company that specializes in organizing and hosting esports events. The founders and employees of the agency consist of eSports, gaming and technology experts. Located in Split, Croatia, for the past two years we have launched a variety of esports projects such as Dota PIT and Counter PIT. Furthermore, we are continually working on exciting new projects that focus on esports events and social marketing campaigns oriented towards fans of esports and gaming. AMD is a leading manufacturer of high-performance computing, graphics and visualization technologies. AMD Ryzen™ processors are designed for impeccable performance for the most ambitious gamers. Radeon™ VII Graphics are for extreme gamers looking to run their games at the highest resolutions, highest framerates, and maximum settings. Radeon™ RX 500 series graphics cards are designed to play games at a smooth 1080p and beyond. Delivering New Ideas and Technology – SAPPHIRE Technology continues to be a world leading manufacturer and global supplier of innovative graphics and mainboard products, delivering its AMD Radeon based products to the PC markets addressing gaming, eSports and performance graphics enthusiasts. HyperX is the high-performance product division of Kingston Technology, the independent world leader in memory products. The HyperX product line includes high-speed DDR4 and DDR3 memory, SSDs, USB Flash drives, gaming headsets, gaming keyboards, mice and mouse pads designed to meet the needs of gamers, over-clockers and enthusiasts. HyperX is committed to esports and sponsors over 30 teams globally. HyperX is known throughout the world for quality, performance and innovation. At Kellogg Company (NYSE: K), we strive to enrich and delight the world through foods and brands that matter. Our beloved brands include Pringles®, Mmmh Tresor ®, Choco Krispies®, FROSTIES®, Kellogg’s Corn Flakes®, W.K.K. and more. Net sales in 2018 were approximately $13.5 billion, comprised principally of snacks and convenience foods like cereal and frozen foods. Kellogg brands are beloved in markets around the world. We are also a company with Heart & Soul, committed to creating three billion Better Days by the end of 2025 through our Breakfasts for Better Days global purpose platform. VPEsports isn’t just about esports and gaming news. It’s about connecting you to a fascinating world where a gamer can watch their favorite esports players do battle or become almost anybody they choose playing the games they love. At VPEsports gaming is more than a hobby or entertainment, it’s an entire cultural movement. We believe that VPEsports is the site that you will come to for the most up-to-date breaking esports and gaming news and everything in between. We couldn’t be more happy to do that for you. AORUS, a premium gaming brand powered by GIGABYTE, delivers a full spectrum of gaming products ranging from gaming laptops, motherboards, graphics cards, mechanical gaming keyboards, to many other gaming hardware and gears, offering the most extreme gaming experiences for enthusiasts worldwide. GRID is a technology platform specialised in esports data solutions. GRID works with leagues teams and brands to unlock the potential of official data assets. GRID is composed of a group of experienced individuals with a successful track record in esports and other technology verticals. Esports data is on the GRID. We have a gamer’s soul and powerful hardware on our minds. Since 2005, we have been producing topnotch MSGW computers: Hi-End Gaming, Business, Entry level. You have special inquiry? We can make the custom-made configuration, just for you. MSGW is integrating hardware for the DotaPit Minor Tournament in Split from it’s very beginning at 2016. And we’re really proud of it! A1 Hrvatska is an innovation leader on the Croatian telecommunications market and a company that recognizes technological and social trends such as video games and popular esports competitions. Besides supporting large European gaming show Reboot InfoGamer powered by A1 and various esports events, A1 Hrvatska launched the largest regional esports league, A1 Adria League, as the leading provider of high-quality content and super-fast Internet – one of the basic preconditions of today’s digital life in the real or virtual world.